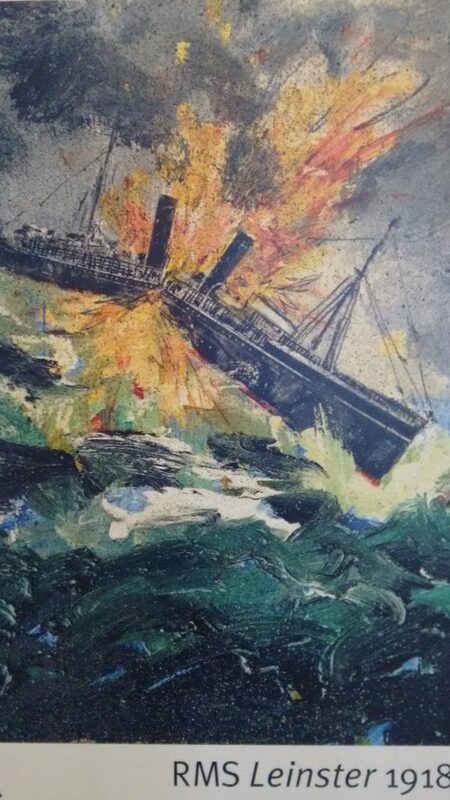 October 10th last was the 100th anniversary of the greatest loss of Irish lives at sea when the “mail boat” (RMS Leinster) was sunk within sight of shore, ten miles off Dun Laoghaire in 1918 just before the end of World War One. Over 500 people were lost when the ship was torpedoed by German U-boat UB-123. It remains the largest loss of Irish lives at sea ever. How did it happen that a passenger ship was attacked so near the end of the War? Who and what was on board the ship? Why were so many lost so near the shore? Could more have been done? Are there any local connections to Skerries or North Dublin? Why have we not heard much about this before? Niall O’Reilly has been researching these RMS Leinster questions for a few years after finding out that a relation of his was one of those lost. He will give an illustrated talk about the ship, the people on-board, the attack, the aftermath, his journey of discovery and a tale of romance lost and found! Niall, a native of Malahide, has lived in Skerries for over 40 years. This is a free talk. Club open at 8.00pm. Talk starts at 8.30pm. Non Members Welcome. Previous PostGP14 Worlds 2020 – AccommodationNext Post2 Great talks in February!